King Hor-Aha’s father was Narmer, and his mother was the Great Royal Wife Neithhotep. His name, Hor-Aha, means “fighting hawk”. This probably referred to the fact that the king of Egypt at that time could not just sit down and enjoy life. There probably had been a lot of fighting in the land, when Narmer unified the country under the rule of one king, and establishing the king’s rule continued during the next king's reign. 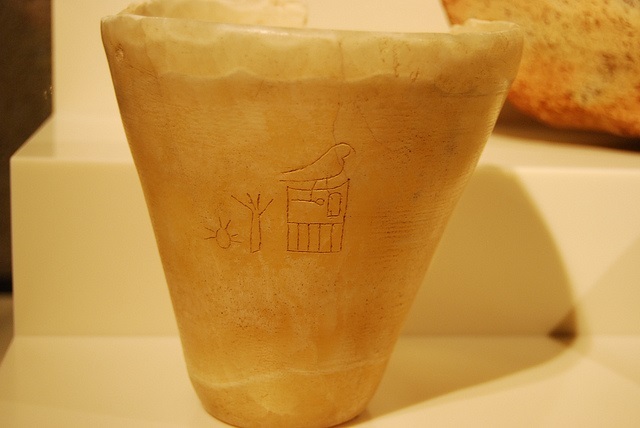 When Aha came to power after Narmer’s death, he chose a second name, or a nebti name, which was Men, “established”. Later historians turned the name into Menes, and it was believed Aha, or Menes, was the first king of ancient Egypt. One of the main reasons for this was that he was the first king mentioned in the Palermo Stone. Nowadays we know better – there were other rulers before him. Because he was already labeled as the first king of the First Dynasty, the Egyptologists later on had to invent a name to the Dynasty before Aha. And what more logical than to call it Dynasty 0. Hor-Aha is considered either the first or second pharaoh of the First Dynasty – some put Narmer as the first king of the first Dynasty. King lists found in tombs of kings Den, and Qaa, list him as king number two of his Dynasty (which we call the First Dynasty). But again we are dealing with such a distant time we can never be totally certain of the facts. But a king he was, and he fought to keep his power. He fought in Ta-Sety, or Nubia as it was later called – a country from which the traditional enemies of Egypt made looting expeditions to Egypt, and later even took over the kingship of the country. But this was not the case yet – Egypt won the Nubian skirmishes. At this time Egypt also had trade connections with Canaan and Byblos. Aha established a temple for the goddess Neith in Sais at the Nile Delta area. Neith was the fierce goddess of warfare – this may reflect the restless times. Also the king’s mother’s name, Neithhotep, means “Neith is satisfied”. The family line may thus already have a tradition of worshipping Neith. 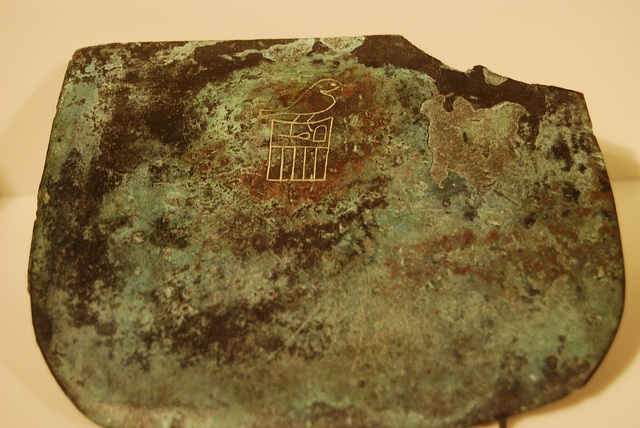 A bronze ax blade with King Aha's name in a serekh. 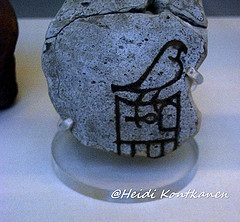 (Neues Museum, Berlin) Copyright Heidi Kontkanen. Aha established the city of Men Nefer, or Memphis as it was later known, which was to be the capital of ancient Egypt for a long time. Its location was chosen between Upper and Lower Egypt, which meant that controlling the river traffic to and from the Delta was that much easier. We have to remember the Nile was the highway of the country – if anything important was happening, the news of it would travel along the Nile. The same applied to trade (convenient for taxation purposes). The historian Herodotos tells us that in order build Memphis the king ordered the river to be diverted, so that there would be land for the new capital. This meant building a dam, which had to be kept in good condition so that the city would not have been flooded. Aha’s main wife, the Great Royal Wife, was Benerib (or Berner-Ib), “Sweetheart”. Her tomb was found near Aha’s. She, however, was not the mother of Aha’s successor. The son who would inherit the crown, Djer, was born to another wife, Khenthap. Aha and Berner-In may have had sons, but as child mortality was high, these may have died young. Another historian, Manetho, tells us that Aha ruled for 62 years and died when a hippopotamus attacked him. These animals may look docile, but are among the most dangerous animals in Africa. Aha had two tombs built – in Abydos, like his predecessors, and at Saqqara. Which tomb in Abydos was actually his is hard to define, as his seals were found in many tombs (which may have been tombs of his officials also). The likely tombs were B10, B15 and B19. There were five chambers underground, and twenty seven rooms built above ground. Thirty three of his officials and servants were killed so they would follow him into the afterlife, and these were buried in so-called subsidiary burials. All of these were young, none over the age of twenty five. Also seven male lions were buried with him. You may check more on finds in Aha’s tomb here. Want to try how much you remember of Pharaoh Hor-Aha? Take this little quiz. 2. What was the other name later historians used of Hor-Aha? 3. Which goddess did Hor-Aha worship? 4. Hor-Aha established a city that was to be the capital of ancient Egypt for a long time. In ancient Egyptian language the name of the city was Men Nefer. By what name is it better known to us? The magninifent photos on this page are copyrighted by Heidi Kontkanen.